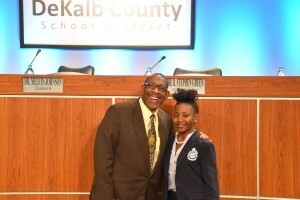 Quinque Williams, a senior at Cedar Grove High School, represented her peers across the DeKalb County School District as the student presentative at the Board of Education meeting on Jan. 9. Williams currently has a 3.98 GPA. She plans to attend the University of Georgia, majoring in Business Marketing Entrepreneurship and Law, to pursue her dreams of becoming an attorney and owning a funeral home. She considers herself a very motivational and effective leader. She serves as the president of the Student Government Association and captain of Cedar Grove High School’s Varsity Cheerleading Team. She is also the ambassador of the Chick-fil-A Leader Academy, secretary of her local Future Business Leaders of America chapter, vice president of New Voices of Cedar Grove High School, first attendant to Miss Cedar Grove, and an active participant of Beta Club and National Honors Society. Superintendent R. Stephen Green and Cedar Grove High senior Quinque Williams pose for a photo after the Jan. 9 board meeting. 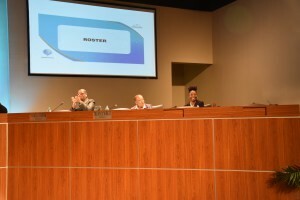 Cedar Grove Senior Quinque Williams smiles while seated at the dais during the Jan. 9 School Board meeting.